Each of the major hazards in the river were given a graphical representation. In the image above the person is shown fishing off the bank: water rises rapidly and unexpectedly, sweeping him away. I have captured a screenshot, but the original graphic is animated. 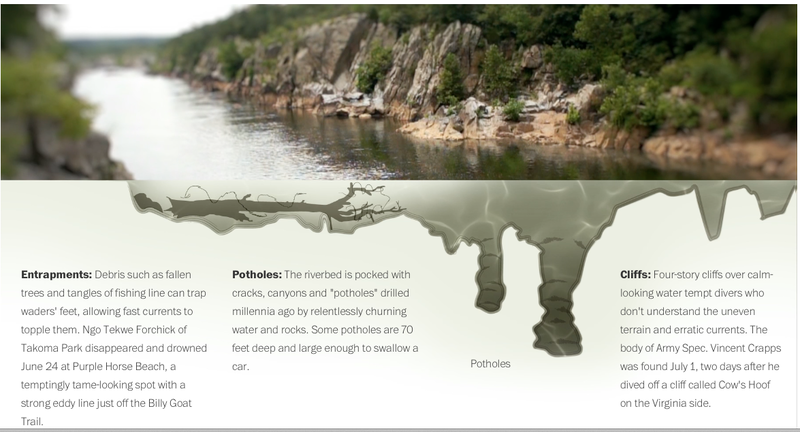 The image below shows hazards beneath the water and on the banks–cliffs that tempt people to jump in, and varied terrain underwater that can kill if you dive in the wrong spot. Too often, in the world of emergency management, images are occasionally included–if one can be dredged up, but they are usually not the focus of the message delivery. 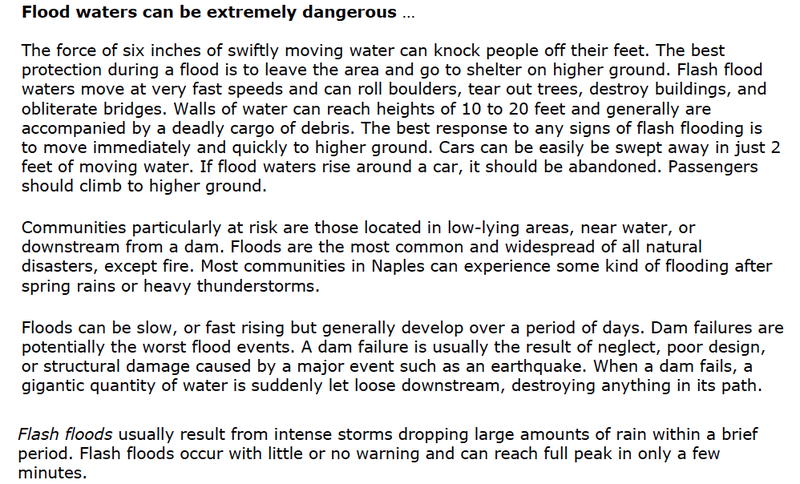 Below is a typical “dangers of [insert-risk-here]” pdf’d fact sheet intended for general public consumption. One glance and I can tell you how many people have read it..not many. I understand why this happens. There is a concern that if information is boiled down to just a few words and images, then that one key item will be left out. This begs the question: how effective are long and involved explanations if the intended audience won’t take the time to read them? Luckily, communicating with the public has gotten easier–almost everyone is connected to the internet (81%) and a large portion of our audience has smart phones in their pockets (over 60% as of July, 2013). Yet, I still see some EMA websites with risk information readily available–as long as you download the pdf. However, as emergency management organizations become more comfortable with social media communications, some have adopted the culture that includes heavy use of imagery. Pinterest, for instance, is a great example of a social platform almost solely devoted to communicating via images. 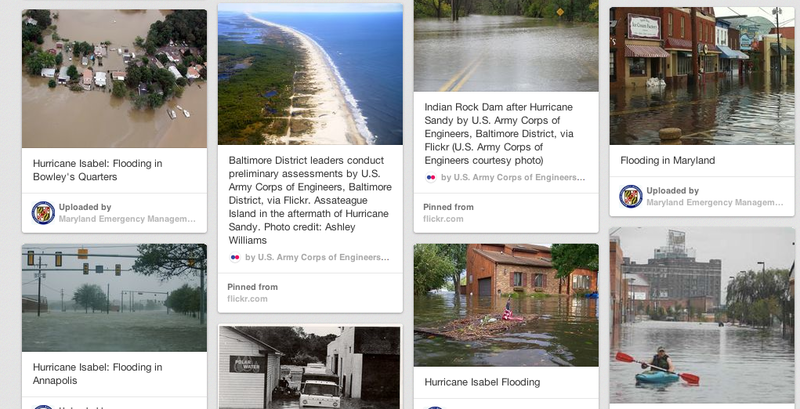 As an example, here’s the same “flood-water-can-be-dangerous message” on the Maryland Emergency Management Agency’s Pinterest page. Twitter, surprisingly, is also a social platform where the use of images is key to building audiences and engagement. Recently the company added inline viewing of pictures and video, making it yet another social network where the image is king. In fact, according to Bufferapp, research even prior to this change showed that Tweets using pic.twitter.com links were 94% more likely to be Retweeted. Data analysis also suggests that Tweets with images also are more likely to receive clicks in the first place. Following my own advice, I will keep this short, but for 2014 I think the trend of communicating risk and preparedness information to the public by using images and graphics will continue to be vital. We have to present information in a way that our audiences want to receive it, not in the way that is most convenient–even if uploading a PDF is handy. This entry was posted in Social Media and Emergency Management, Uncategorized and tagged Communication, Infographic, Information design, Pinterest, Washington Post, Wikipedia. Bookmark the permalink. I generally agree. But you must note that none of the dozens of pictures on Pinterest offers specific guidance on what to do, what to avoid, where risk is highest, etc. We can’t just give up and say “most folks won’t read.” The ones that do may save their own lives. Thanks for you comment, Doug. Your point is well taken, however, guidance on what to do, where to avoid and where the risk is highest, can all also be communicated visually. I’m not arguing for the end of the written word, but I am advocating a more thoughtful approach to how we communicate with a population that has a limited attention span. Couldn’t agree more, Kim. A thoughtful post with good examples. Here’s a little additional thought. While Pinterest provides a valuable platform for images and messages, the world of Instagram is rapidly capturing a new demographic, integrating powerful outreach, photos and messages in innovative approaches. (Haiyan offers some good images/campaign outreach.) I’m seeing some impressive uses of the posts as a kind of “new” fact sheet. Hope all these various platforms keep getting used in an integrated way to reach our audiences. The strategy of risk/crisis communications just keeps getting more interesting, don’t you think? Thanks so much for your input Suzanne. It is interesting how large-scale disasters that involve an international relief effort often spur innovation. I agree that risk/crisis communication is getting more interesting–I think 2014 will bring even more surprises as technology continues to evolve (e.g. Google Glass). Great post Kim. I attended a few social media conferences this year, and risk/crisis communications was prominent in the agenda. Participants showed how they’ve been using image-sharing social media to bring both magnitude and specificity to what are otherwise LARGE CAPS / dehumanized bulletins. While I agree with other comments that we need to do much more with the visual communications (Washington Post example being a great one) it’s gratifying to see governments, utilities, and other professionals integrating this media.